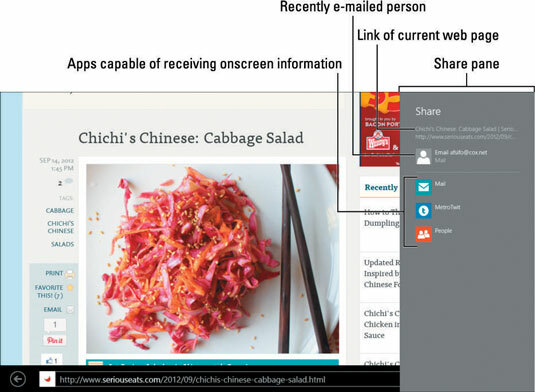 Windows 8’s apps have a easy-to-use Share icon. Sharing items from your tablet begins with a trip to the Charms bar. Fetch the Charms bar by sliding your finger in from the right edge; then tap the Sharing icon. When the Sharing pane appears, you see every app capable of sharing your screen’s current contents. For example, tap the Mail icon, and the Sharing pane shows the Mail app, letting you type an e-mail address and send the page on its way. Link’s name: The web link you’re sending appears at the top. Previous recipients: The Share pane lists the last five people you’ve shared things with previously, and the app you used to share them. For example, a tap of an e-mail address shares the item with that person again, saving you the bother of typing the address. Apps capable of sharing: Here, the program lists all of your apps that are capable of sharing web links. Tap an app to load the app and share the link. When you spot the People app, tap it to share the web link with your social networks. You can send the link via a Twitter post or a Facebook app, for example. Not all apps can share. If you don’t see an app listed, it’s not able to share that particular content.